Part of the 2018 Collection, this zip-up scuba-style dance top with plush elasticized back strapping detail is stunning. This top has a nice secure fit on the rib cage and full arm movement at the shoulders which makes dancing to your full potential possible without the wardrobe malfunctions! 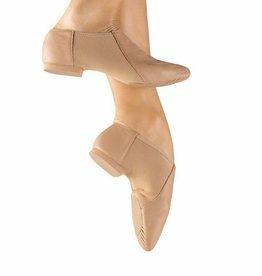 Java leather split sole jazz shoe by So Danca is a top selling jazz shoe with a neoprene insert under the arch which hugs and contours the foot. Available in child and adult sizes in two popular dance shoe colours.